Sarah Bird shows off the boots she received for the Texas Writer Award at the Texas Book Festival in 2014. Austin author Sarah Bird will join the KUT Book Club this Monday, Feb. 11, for a discussion of her book A Love Letter to Texas Women. Morning Edition host Jennifer Stayton will lead the discussion at BookPeople at 7 p.m. Bird says in her book that Texas women "come with an indelible brand ... an identity ... A belief that there is something special about the ladies of the Lone Star State." What is it that distinguishes Texas women: the famous Yellow Rose and her descendants? Is it that combination of graciousness and grit that we revere in First Ladies Laura Bush and Lady Bird Johnson? The rapier-sharp wit that Ann Richards and Molly Ivins used to skewer the good ole boy establishment? The moral righteousness with which Barbara Jordan defended the US constitution? An unnatural fondness for Dr. Pepper and queso? In her inimitable style, Sarah Bird pays tribute to the Texas Woman in all her glory and all her contradictions. She humorously recalls her own early bewildered attempts to understand Lone Star gals, from the big-haired, perfectly made-up ladies at the Hyde Park Beauty Salon to her intellectual, quinoa-eating roommates at Seneca House Co-op for Graduate Women. After decades of observing Texas women, Bird knows the species as few others do. Bird, who won the The Austin Chronicle's Best Fiction Writer award in 2017 for the sixth time and won the 2014 Texas Writer Award at the Texas Book Festival, is the author of 10 novels. Her latest, Daughter of a Daughter of a Queen, was released in September. Read more about the author at SarahBirdBooks.com. BookPeople is located at 603 N. Lamar Blvd. in downtown Austin. You can follow the KUT Book Club Facebook group for updates on our monthly events. 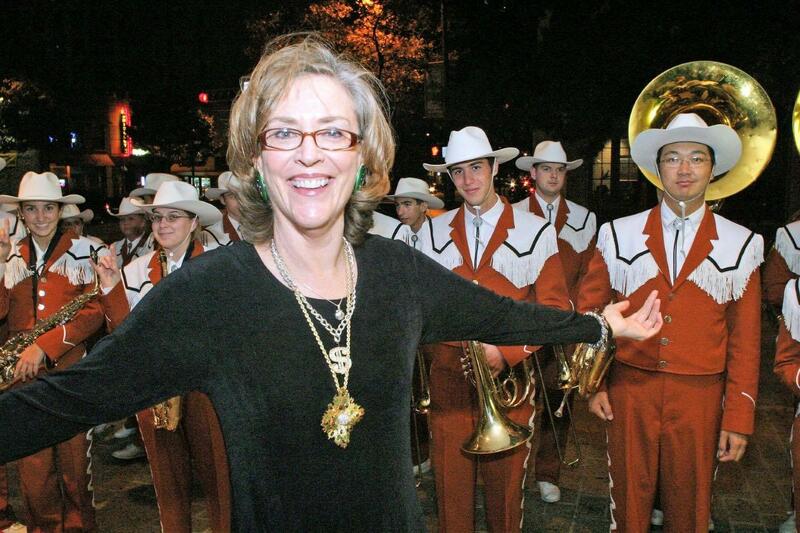 Sarah Bird and the Longhorn marching band. We Started A Book Club. Here's How To Join. Back in February, a future Austinite named Dan wrote into our ATXplained project, asking for recommendations for books about Austin and Texas to help orient him to the city. Austin novelist Sarah Bird has been writing for a while. Long enough to become beloved in Austin and build a loyal following for her fun, easy stories with an Austin flair. But this month, Sarah Bird's about to ruin her reputation. Her new novel, Above the East China Sea looks at life from a completely different perspective.